A nice villa in a small street of Siem Reap is where Angkor Artwork makes the most beautiful lacquerware. A visit to the lacquer workshop, tucked in the shaded garden is a wonderful experience. 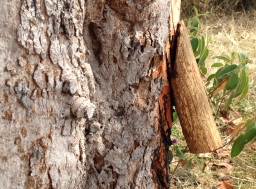 Here only vegetal lacquer from the sap of local lacquer trees is used. It is applied, pure or dyed with mineral pigments, in multiple layers and combined with gold or silver leafs onto objects or textile panels. 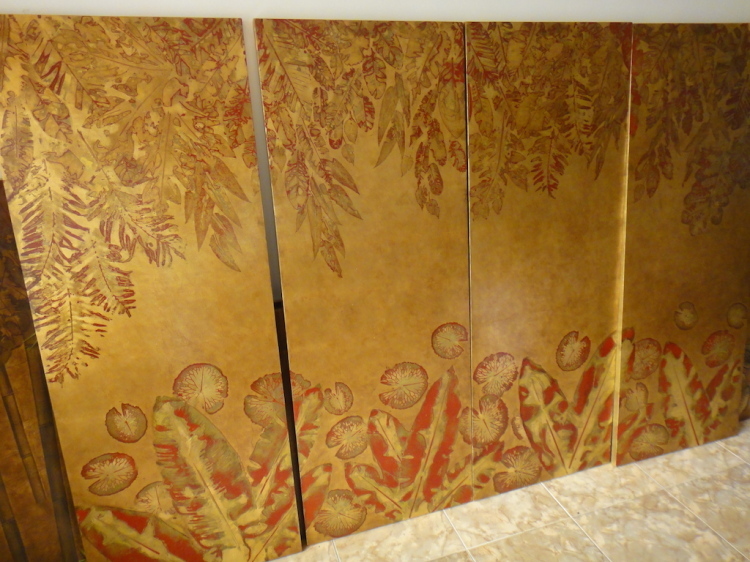 It is fascinating to observe the young artists overlaying vegetal leaves or thin gold or silver layers to the lacquer to form stunning pieces, from small boxes to large wall panels . Eric Stocker has been a specialist of lacquer, gold and polychromy since 1974. He has been a restoration expert for the French national conservation authorities. In 1998 he was invited to join a European Union program to revitalize traditional arts in Cambodia. 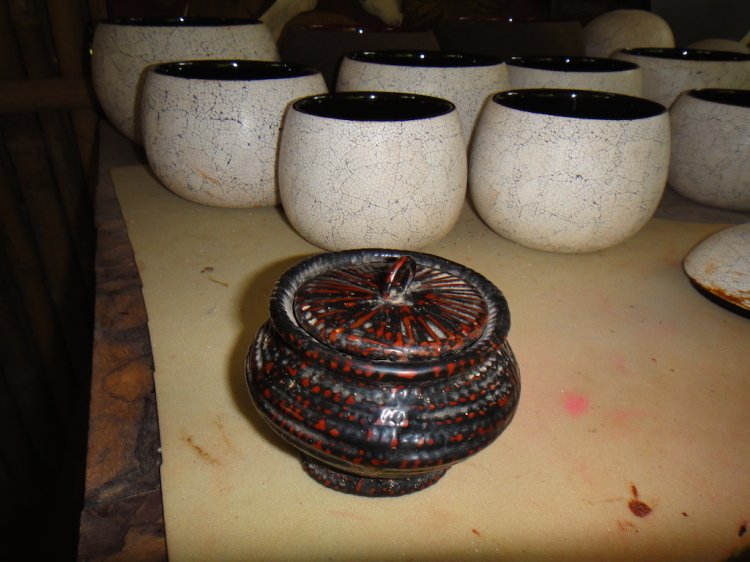 Under Eric’s direction, this program has trained 350 young Cambodians in lacquerware, gold and polychromy. In 2008, along with his brother Thierry who was active in the same art in France since 1978, they create Angkor Artwork with young Cambodian craftsmen . The term lacquer originates from the Sanskrit word laksha (लक्ष) meaning “wax”, which was used for both the Lac insect (because of their enormous number, lakh meaning also 100,000 in Hindi) and the scarlet resinous secretion it produces that was used as wood finish in ancient India and neighbouring areas. In terms of modern products, lac-based finishes are referred to as shellac. While both lacquer and shellac are traditional finishes, lacquer is more durable than shellac. 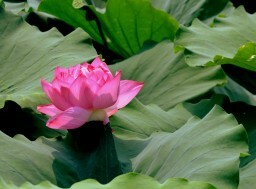 The active ingredient of vegetal lacquer is urushiol. It is slow-drying, and set by oxidation and polymerization, rather than by evaporation alone. 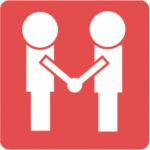 In order for it to set properly it requires a humid and warm environment. Lacquer produces very hard, durable finishes that are both beautiful and very resistant to damage by water, acid, alkali or abrasion. It is derived from the tree Toxicodendron vernicifluum, originating from China and commonly known as the Lacquer Tree. The fresh resin from the T. vernicifluum trees causes urushiol-induced contact dermatitis and great care is required in its use. Lacquer-yielding trees in Thailand, Vietnam, Burma and Taiwan, called Thitsi, are slightly different; they do not contain urushiol, but similar substances called “laccol” or “thitsiol”. The end result is similar but softer than the Chinese or Japanese lacquer. Unlike Japanese and Chinese Toxicodendron verniciflua resin, Burmese lacquer does not cause allergic reactions; it sets slower, and is painted by craftsmen’s hands without using brushes. The traditions of lacquerware are oldest in China and Japan where they have been dated back to prehistoric times. Japan has retained intact their lacquerware traditions and craftsmanship. Today’s master craftsmen are able to create unique works of art . 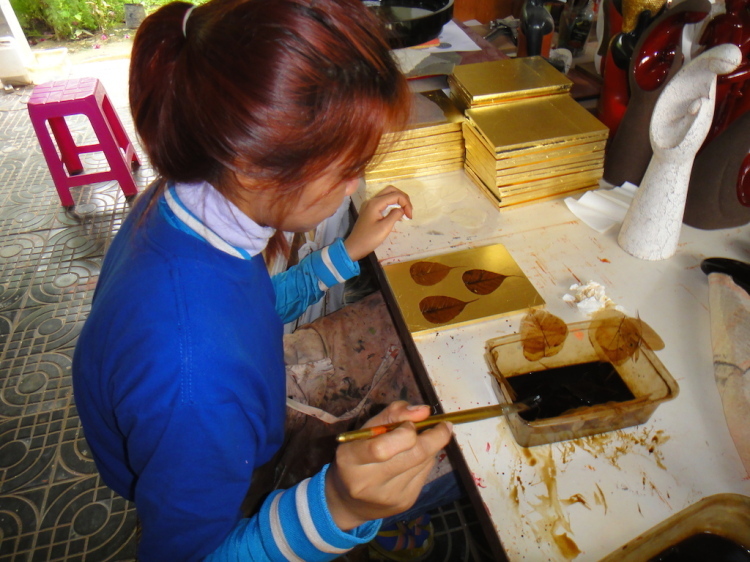 In Cambodia, lacquer has been used commonly in Cambodia for many centuries. 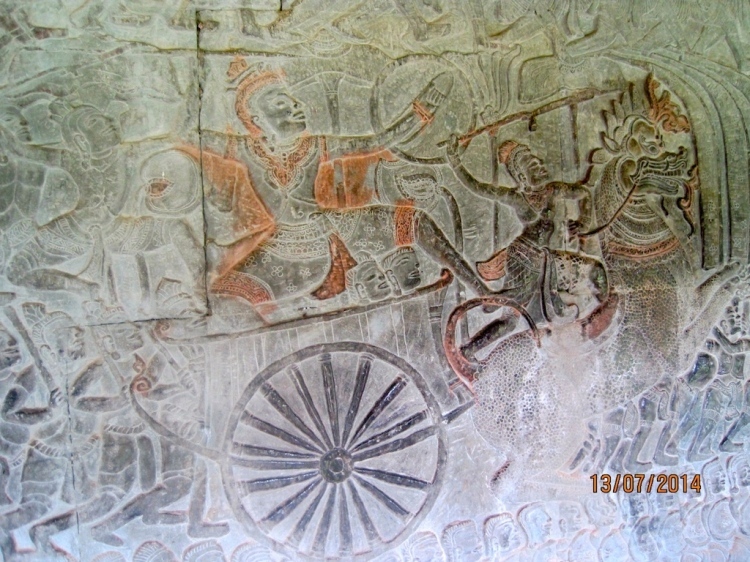 Recent investigations have shown that Angkor Wat sculptures have been lacquered and dyed between the 12th and 16th centuries CE. Iron oxides were used to obtain the different red dyes. The chemical analysis showed that real lacquer was used, not shellac . Lacquer has also been used to make baskets water tight and examples of this craft can still be found throughout Cambodia as this small box shown to me by Thierry Stocker in his workshop. A first layer of lacquer grout is used to cover the basket, then the liquid lacquer is overlaid. After drying, a smooth finish is obtained by polishing. Lacquer is especially valuable because of its durability and protective qualities. Lacquer resists temperatures as high as 450 degrees Celsius and has been used on such things as electrical wires and cables, for painting boats, or even for protecting electronics inside a mobile phone. Before the last world war, Cambodia was exporting 50 tons per year of lacquer to France, to be used for instance in industrial paint. The recent wars have changed all this. Craftsmanship and knowledge of the techniques were largely forgotten and many lacquer trees, a wood of high commercial value, were cut down. 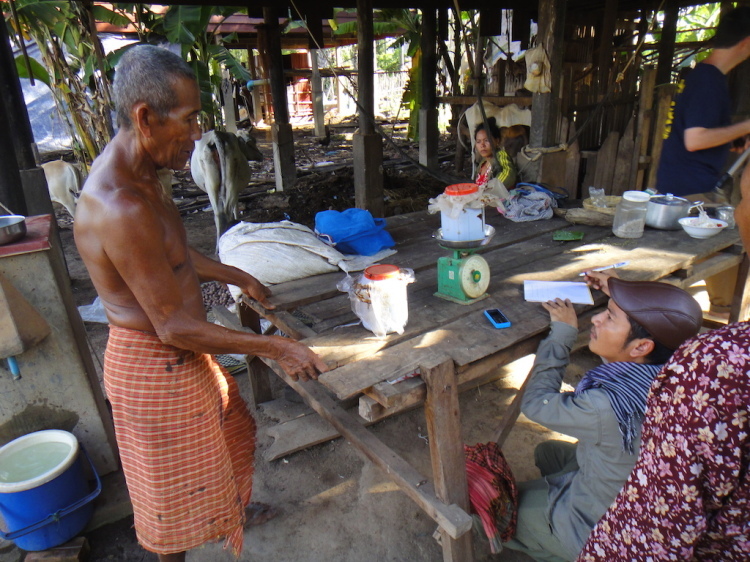 In 2013, Community First got to know one of the last lacquer collectors in Prolay village, Kompong Tom province. Ta Ly is still using the traditional tools and techniques to collect the precious sap in the few remaining lacquer trees in his area. The trees are scarred in series of successive locations along the main branches. The flow of sap is very slow (about 6 grams per week). The sap is kept in a tightly sealed container until there is enough to be brought up for sale. Community First has discovered in the Bophana video archives in Phnom Penh a documentary from the 1990’s showing the traditional dance Chak Mreak of men and women of the Moui which illustrate the practice of collecting and processing the lacquer . The dance takes place in Sambor Prei Kuk in the Kompong Tom province and is testimonial to the persistence to these traditions until today. In September 2014 Community First will join Eric and Thierry Stocker for the 10th anniversary of the Japanese Lacquer Exchange in Pagan, Myanmar where the greatest Japanese masters meet. A. Kiesewetter et al. “On the Polychromy of Angkor Wat Results of Initial Paint Color Investigations” German Apsara Conservation Project. In Journal of Khmer Studies UDAYA, Nov 2, 2001. Did you know that lacquer actually comes from a tree?